The administration of local anesthesia, sedation, and general anesthesia is an integral part of dental practice. Local anesthesia is the temporary loss of sensation including pain in one part of the body produced by a topically applied or injected agent without depressing the level of consciousness. Local anesthetics act within the neural fibers to inhibit the ionic influx of sodium for neuron impulse. This helps to prevent transmission of pain sensation during procedures which can serve to build trust and foster the relationship of the patient and dentist, allay fear and anxiety, and promote a positive dental attitude. Local anesthetics are frequently administered in dentistry and thus can be expected to be a major source of drug-related complications in the dental office. The most frequently observed complications (dizziness, tachycardia, agitation, nausea, and tremor) were transient in nature and did not require treatment. Local anesthesia avoids some of the risks and unpleasantness associated with other forms of anesthesia, such as nausea and vomiting. The anesthetic action extends for longer than required and therefore provides pain relief for several hours after the operation. Local anesthesia is associated with reduced blood loss. Topical anesthetics can be applied painlessly without needles and can reduce the need for physical and chemical restraints. They also avoid the tissue distortion that occurs with infiltrated anesthetics. Topical anesthetic agents are available in gel, liquid, ointment, patch, and aerosol forms. Thus, the main purpose of this study is to evaluate the current status of dental anesthesia among dentists. A survey was conducted among fifty pediatric dentists from South India. 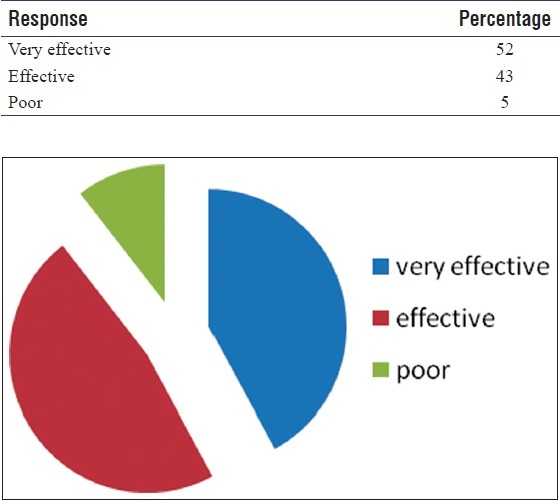 The survey included consists of a questionnaire including questions relating to the use of local and topical anesthetics utilized among pediatric patients, length of time used to inject a cartridge, factors deterring the dosage of anesthetics, form of systemic anesthetics used most commonly in children, length of the needle used often, effectiveness of topical anesthetics over local anesthetics, and what is his/her patients' most disliking factor about the topical anesthetic. 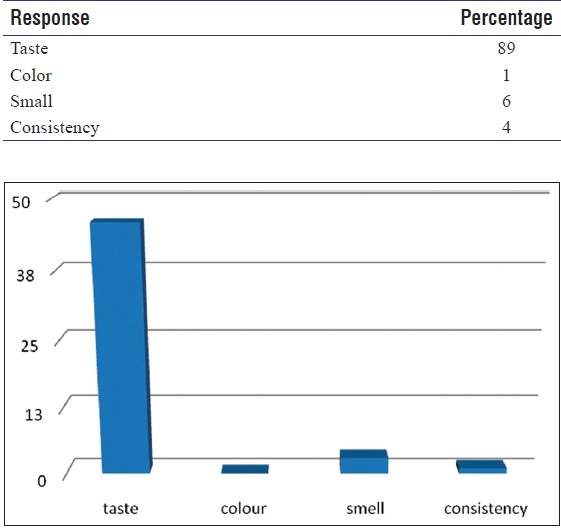 Finally, the data were analyzed by calculating the percentage response for each question. 1. How often do you use anesthesia for treating pediatric patients? 2. What is the common age group of pediatric patients requiring anesthesia? 3. Which do you use commonly? 4. What form of systemic anesthetic do you use the most? 5. Do you use any topical anesthetic gel? 6. What is the most important factor that you consider commonly when you decide on dosage of local anesthesia that you will inject? 7. What length of needle do you use most often? 8. How much time do you take to inject a full cartridge? 9. Do you prefer topical anesthetics are effective than local anesthetics? 10. What is the disliking factor about topical anesthetic? a. Taste b. Color c. Small d. Consistency. All the questions in the questionnaire were answered by dental students. 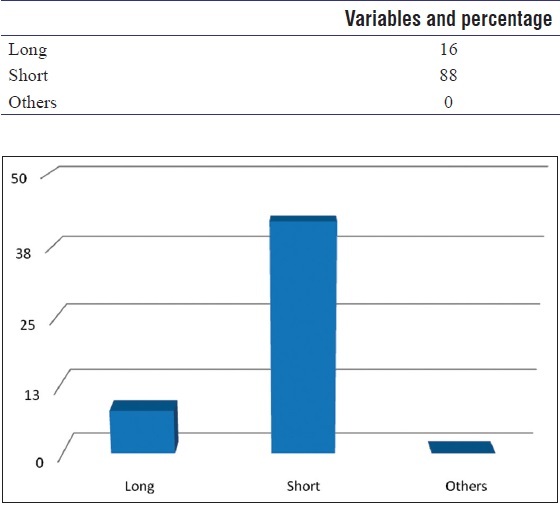 The data collected are represented as a bar graph. 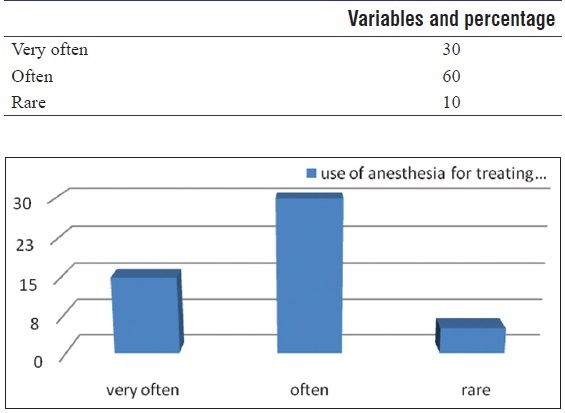 Sixty percent of dental students use anesthesia often for treating pediatric patients while 30% use anesthesia very often and 10% use it rarely [Table 1]. 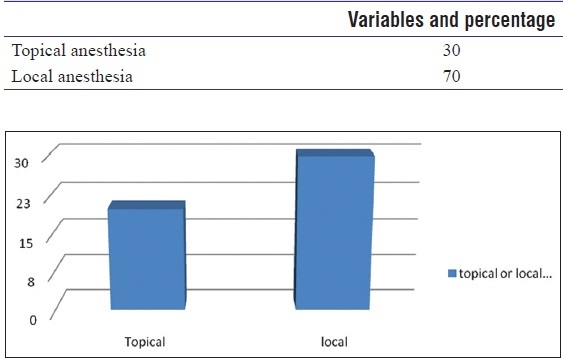 About 70% of dental students prefer local anesthesia whereas 30% prefer topical anesthesia [Table 2]. The response for the form of systemic anesthetic used is about 66% in case of infiltration and 36% in case of infiltration [Table 3]. The responses for the topical anesthetics are tabulated in [Table 4]. 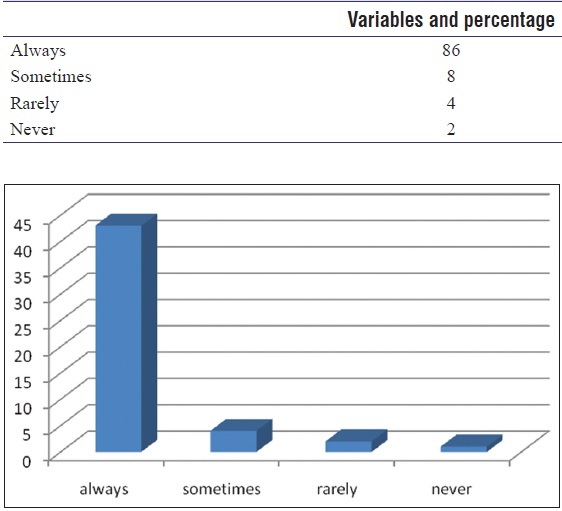 The respondents' responses to the question regarding the use of topical anesthetics, a majority of the respondents (86%) always used a topical anesthetic while 8% sometimes used a topical anesthetic. Only 4% reported that they rarely used topical anesthetic, with 2% reporting that they never used a topical anesthetic. 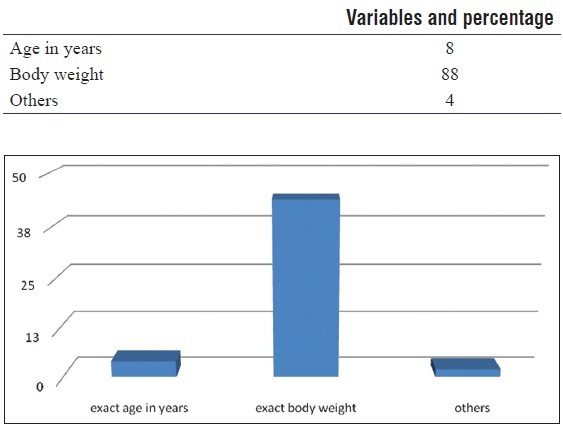 When questioned which criteria practitioners used to determine the local anesthetic dosage, almost half of the respondents (88%) reported using exact body weight when determining the dosage of local anesthetic for each pediatric patient while 8% used the patients' age and 4% used other methods such as number of teeth needing to be treated, length of treatment, and degree of carious involvement [Table 5]. 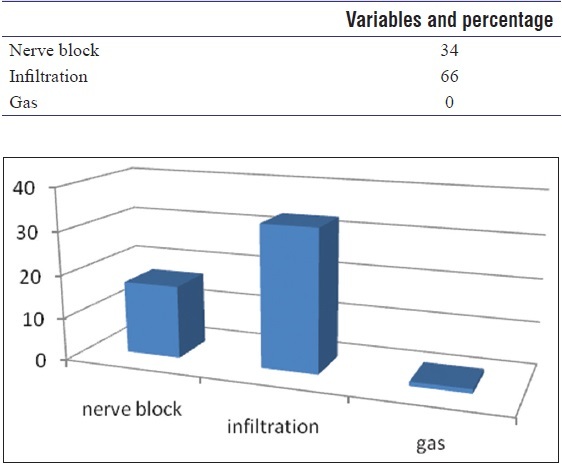 Most of the respondents (88%) used a short needle, whereas 16% used a long needle for infiltration/nerve block [Table 6]. When questioned regarding the amount of time taken to inject a full cartridge of local anesthetic, 10% took < 10 s, 24% took 11-20 s, and 66% took 31-60 s [Table 7]. When asked about the effectiveness of topical anesthetics, 32% perceived them as effective, 36% as very effective, and 8% as poor [Table 8]. 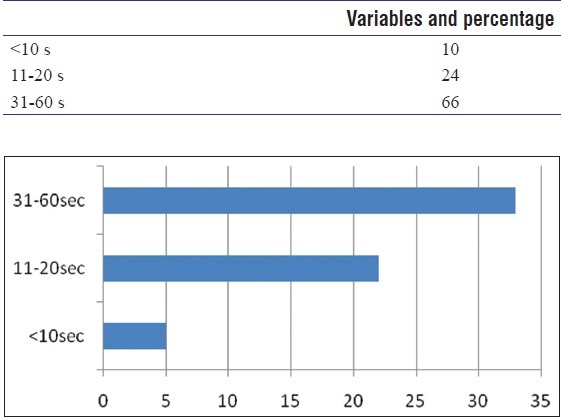 When questioned concerning the different properties of topical anesthetic, most patients did not like the taste (98%) and consistency was not favored by 2%, with 6% reporting complaints by patients including burning, numbness of the entire mouth, and inability to swallow [Table 9]. Topical anesthetics are effective to a depth of 2-3 mm and are effective in reducing the discomfort of the initial penetration of the needle into the mucosa. Its disadvantages are the taste may be disagreeable to patient and the length of application time may increase apprehension of approaching procedure in the pediatric patient. Most practitioners responded that the current topical anesthetics they were using in their offices were very effective (36%). The fact that 2% of them perceived topical anesthetics to be ineffective. Most practitioners responded that their patients disliked taste, consistency, and warm/burning sensation of the topical anesthetic. The findings of this study demonstrate that pediatric dentists are most commonly using local anesthetic as the preferred type of using short needle for infiltrations and blocks. Most were taking anywhere from 31 to 60 s to inject a cartridge. Topical anesthetic was used by most and also the preferred one. However, their perception of the effectiveness of topical anesthetics varied. There also appears to be a need to develop newer and better mode of topical anesthetic delivery system in the pediatric dental population. Malamed SF. Basic injection technique. In: Handbook of Local Anesthesia. 6 th ed. St. Louis, Mo: Mosby; 2013. p. 157-68. Kravitz ND. The use of compound topical anesthetics: A review. J Am Dent Assoc 2007;138:1333-9. Steward DJ. Manual of Pediatric Anesthesia. New York: Churchill Livingstone; 1979. p. 5-13. Hollander JE, Singer AJ. Laceration management. Ann Emerg Med 1999;34:356-67. Berde CB. Toxicity of local anesthetics in infants and children. J Pediatr 1993;122 (5 Pt 2):S14-20. Rosivack RG, Koenigsberg SR, Maxwell KC. An analysis of the effectiveness of two topical anesthetics. Anesth Prog 1990;37:290-2. Corssen G. Intravenous Anesthesia and Analgesia. Philadelphia: Lea and Febiger; 1988. p. 99-174. American Academy of Pediatric Dentistry: Guidelines. Local anesthesia considerations during sedation. Pediatr Dent 1999;20:49. Malamed SF. Pharmacology of vasoconstrictors. In: Handbook of Local Anesthesia. 6 th ed. St. Louis, Mo: Mosby; 2013. p. 25-38. Hersh EV. Local anesthetics in dentistry: Clinical considerations, drug interactions, and novel formulations. Compend Contin Educ Dent 1993;8:1020-30. McDonald RE, Avery D, editors. Local anesthesia for the child and adolescent. In: Dentistry for the Child and Adolescent. 7 th ed. St. Louis: CV Mosby Co.; 2000. p. 283-4. McGrath PJ, McAlpine L. Psychologic perspectives on pediatric pain. J Pediatr 1993;122 (5 Pt 2):S2-8. Malamed SF, editor. Drug overdose reactions. In: Medical Emergencies in the Dental Office. 4 th ed. St. Louis: Mosby Co.; 1993. p. 230.